Arena das Dunas, in Natal, Rio Grande do Norte, will be used during FIFA World Cup. The Arena das Dunas in Natal, Rio Grande do Norte, which will host four group stage matches during the 2014 FIFA World Cup Brazil, has been inaugurated by President Dilma Rousseff. The world’s leading sports architecture practice, Populous, designed Arena das Dunas including the landscape and masterplan of the surrounding areas. The venue, which was inspired by the coastal city of Natal’s sand dune landscape, has a capacity of 42,000 with 10,600 removable seats and has been delivered on time. Christopher Lee, Senior Principal at Populous and Lead Architect of the Arena das Dunas commented: “Brazilians are passionate about their football and are rightly proud of their country’s unparalleled record in the World Cup. 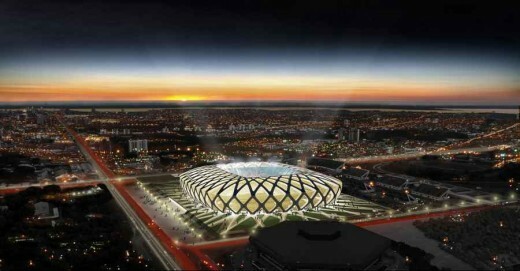 The Dunas Arena is designed to be a multipurpose venue. The main stadium will host sports events, trade shows and concerts, and the stadium’s 22,000m2 outdoor plaza will also host events. 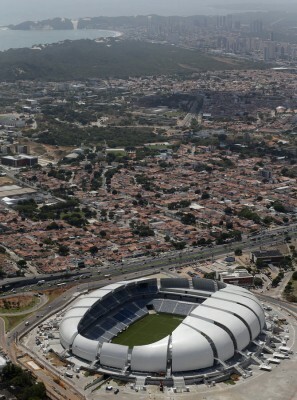 The first matches at the stadium took place on 26 January when the state of Rio Grande do Norte’s main soccer teams faced each other in a double round: América-RN vs. Confiança-SE for the Northeast Cup, and ABC vs. Alecrim for the Rio Grande do Norte State Championship. The local soccer clubs ABC and América have signed an agreement with the Dunas Arenas management consortium to use the venue for their home games for the next 20 years. “The arena is in the city centre and after the World Cup we can set up a commercial area between the access ways,” said Charles Maia, Dunas Arena director. The arena’s design is unique. Its façade and roof are integrated and made up of 20 petal-shaped modules, designed to be higher on one of the stadium’s sides, giving the impression that the sand dunes – which are common in the region – are moving. The design also enables more ventilation and light to come into the stadium. The petal-shaped structures of the roof are made of steel trusses, covered on the outside with aluminum tiles, with thermal and acoustic insulation. Internally, they are coated with a PVC prestressed membrane. The parts are joined by translucent polycarbonate, which allows light to come through. Fans going to matches and events at the stadium will notice a new standard of comfort and safety. In total, there are 21 access ramps to reach each of the four stadium levels, in addition to elevators that connect the indoor car park directly with the 39 boxes. The Dunas Arena also has four lounges that can accommodate up to 1,000 people, 25 food and drink kiosks, as well as 30 restrooms. There are four types of seats, identifiable by varying shades of blue: general public, hospitality, VIP and Executive VIP. In addition, 521 seats are reserved for people with disabilities. A security team in the arena’s command and control center is able to monitor images recorded by 200 cameras with facial-recognition capability in the ground’s external and internal areas. The PA system is integrated with the stadium’s two 64 square meter screens, allowing for information and match statistics to be clearly displayed to the crowd. Players will also notice improved match conditions. The Bermuda Tifton 419 grass species used for the pitch is ideal for the region’s hot climate, and the drainage system allows for matches to be played even on extremely rainy days. With the first row of stands only 15m away from the pitch, fans will be close to the action. In addition, the arena’s lighting system, which uses 306 floodlights, provides uniform and consistent visibility, eliminating shadows and facilitating TV broadcasts using Full HD technology.